Wrap cheese slices around hot dog or a whole hot dog. Or if you cut the hot dog in half like the picture below. Just use very tiny pieces of cut up cheese. 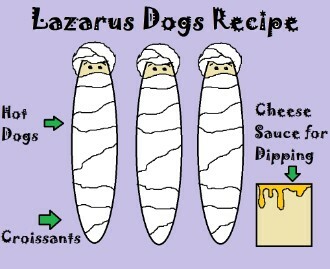 Wrap croissants around hot dog like a mummy. Leave a space open for eyes. Dot mustard or cheese for eyes.